The JWC EEC was formed during the drought of 2001 to coordinate JWC partner conservation efforts. The committee oversees public participation, joint public messaging, and outreach efforts in conservation and water science. Key objectives of the group include: increasing name recognition for the JWC and educating Washington County customers about water conservation, backflow prevention, and the significance of the Tualatin Basin for water supply. The JWC EEC primarily uses its website and joint Washington County events to reach its audience, along with public relations and occasional paid-media efforts. The EEC launched a new website in July 2007 that includes an indoor and outdoor conservation tip section and a "Ten Gallon Challenge," that encourages customers to explore ways to save ten gallons of water every day. The site also contains a link to the Regional Water Providers Consortium (RWPC) website, www.conserveh2o.org. This website is the primary water conservation website for the tri-county area (Washington, Multnomah, and Clackamas Counties.) All JWC partners are members in the RWPC. JWC representatives celebrate public works with other public agencies at this Washington Square Mall event. JWC representatives draw kids in with an interactive activity, such as making buttons with water conservation messages, while they showcase regional supply and storage issues for the parents. The booth display provides information on saving water and other water topics. Tualatin Valley Cable Access films the event and broadcasts a show highlighting each participant, so the JWC usually does a short segment on saving water. The JWC participates in the Washington County Community Action Fair because it serves all of Washington County. The Fair’s objective is to provide information and other forms of utility assistance to minorities and other low-income groups. The Fair changes venues every couple of years and has been located in Hillsboro, Beaverton, and Aloha in recent years. JWC staff hands out water saving devices to customers and instructions are included in English and Spanish. The JWC uses this event to promote its high quality drinking water and educational water programs, including water conservation, to the entire county. Approximately 10,000 people attend the fair over a four-day period, and the JWC booth is staffed by two JWC partner representatives at all times. JWC distributes free, fresh, cold water to hot and thirsty fair-goers as a means to engage in discussions about water conservation. Fair booth staffers from Hillsboro, Forest Grove, Beaverton, Tigard and TVWD also hand out silicon bracelets, mood pencils and writing tablets promoting the JWC website. 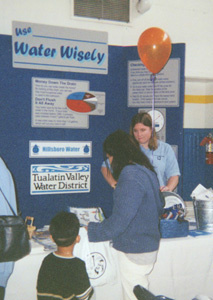 Displays always include a water conservation component and illustrate a water educational theme, such as promotion of the Ten Gallon Challenge. The JWC co-sponsors Naturescaping Workshops throughout Washington County with its partner, Clean Water Services. These workshops are free to the public and teach landscaping techniques incorporating native and low-water use plants that also attract bees, birds, and butterflies. The objective of the workshops is to lower peak season water use. 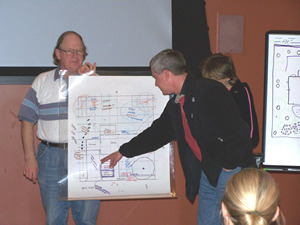 Workshops have been held in Tigard, Beaverton, and Hillsboro.